This is ridiculous. I thought I would have no trouble keeping up with my blog. I love to write. Writing is what I do when I don’t know what to do. Why, then, am I not keeping up with my blog? The obvious problem is that I’ve said I want this blog to motivate me to do other creative things, so if I’m not doing those things, I have nothing to blog about. My blog has a purpose and it is failing to achieve that purpose. Do I still deserve to have a blog? I have a friend who suggested blog posts themselves should be counted as creative achievements. At the time, I thought that would make the whole thing too easy. My inner critic is laughing his head off. It’s an evil laugh. He thinks I’m a complete slacker and I will never do anything creative. I am determined to prove him wrong. If I don’t do anything else, I will do this one thing; I will write this blog. I’ve decided that I’m just going to do it. At least once a week, I will update this blog. If I haven’t done anything creative, I will blog about something else, but I will blog. I will not count blog entries on my list of fifty things, because that list is supposed to be for all the things I dream of doing but never do. Writing is something I do every day, thanks to Julia Cameron and The Artist’s Way. If I can write Morning Pages every day, I can write a blog post once a week. Some entries will be entirely lame. I’ve decided to go ahead and live with that instead of trying to live with the fact that I am not keeping up with my blog. I would love to make every entry a polished gem about a wonderfully creative thing I have accomplished that week, but the truth is, I struggle. I resist. Instead of doing something creative, I might just read about someone else doing something creative. I might just read a fantasy novel or watch an uplifting movie. I might spend hours on Facebook, resisting the urge to correct people’s grammar. I imagined doing that polished gem kind of blog and I imagined a perfect year of being creative in all the ways I have not been creative since I quit the cubical job, but I am learning that any blog I can actually keep up with will have to be more honest and real than that. I struggle. I will keep on struggling, because that’s what I do, but I will not neglect the blog. If I can’t do anything else, I can write. It’s what I do when I don’t know what to do. This entry was posted in Uncategorized on July 31, 2013 by releaf1954. This was not unexpected. I knew there wasn’t much likelihood of a blog entry getting done in April or May. Our biggest tie-dye event is on Memorial Day weekend and we spend all of April and May getting ready for it. After a twelve-hour dyeing day, I just don’t seem to have much enthusiasm for blogging. Okay, so what’s my excuse for June? Well, first there was the recuperation time. That came after the putting-together-the-deposit time and included the getting-over-the-cold-I-caught-at-the-festival time. Then came the vacation time. My husband and I always take a vacation in June, usually around our anniversary on June 15th. This time, we left on the 14th and stayed until the 21st. We camped out on our North Carolina land and we spent a couple of nights in Asheville. My sister and her husband also spent time in North Carolina that week, so we were able to get together and share some bucket-list busting fun. 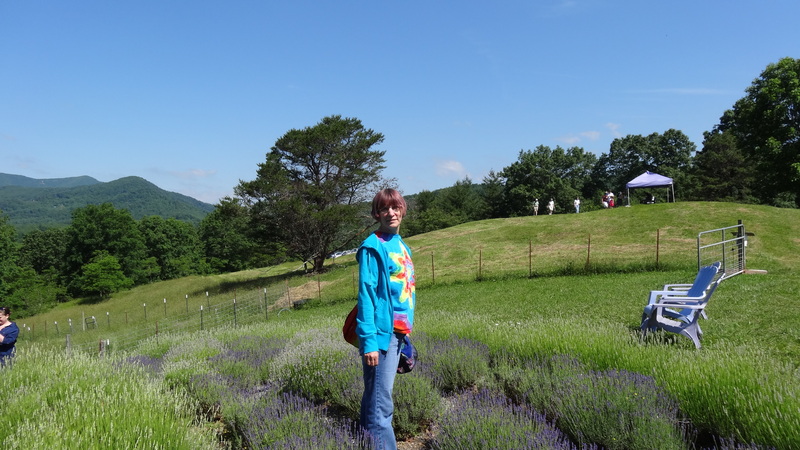 I have always wanted to walk a labyrinth and my sister had told me about a beautiful one made of lavender at Mountain Farm in North Carolina. We got there just in time for the Lavender Festival this year, so I was able to walk the Lavender Labyrinth and enjoy all kinds of special activities. Rumor has it that the folks in charge of the farm and the festival will be closing the place to the public before next summer, so we caught the very last Lavender Festival. Mountain Farm is still open to the public, at least for now, and I highly recommend this beautiful spot for the lavender, the llamas, the adorable baby goats and a gift shop full of lavender-infused products. We decided to try the smokey salt, which includes lapsang souchong tea and lavender. We put it on just about everything we cooked over a fire back at our campsite and it improved everything it touched. The labyrinth at Mountain Farm let me cross one thing off my bucket list. Later the same day, we went to the Rhododendron Festival in Bakersville and I was able to check off one more item. When we were first looking at land in North Carolina, Bakersville was one of the places where we met our realtor before heading off to look at properties. I remember noticing a pretty walkway along the river there and I wanted to take a closer look. We didn’t have time on that trip, but once we actually bought land in the area, that walk went on my bucket list. 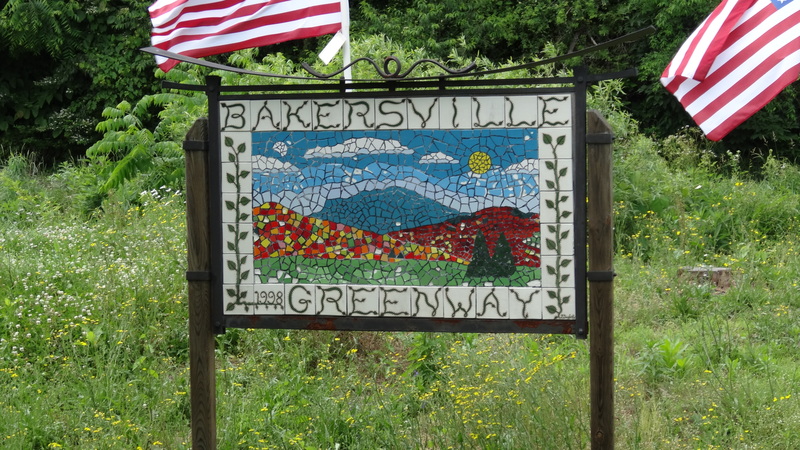 It’s called the Bakersville Greenway and it offers a beautiful stroll along the river – made even more delightful this day by the presence of festival vendors, including soft-serve ice cream. That was a nice treat on a hot day. That was the second item I got to cross off my bucket list on my June vacation. The third one was the best of all, because it had been more of a fantasy than a goal, since I didn’t know if it was a real possibility. My sister bought her land before we bought our land, which is just over a ridge from hers, in Green Mountain Township near Burnsville. In the thrill of that purchase, I imagined that one day, we might be able to sing at an open mic together in Burnsville. This June, it happened, on a Friday night in a restaurant called “Mary Jane’s Bakery Cafe”. It was a spur-of-the-moment suggestion from my sister and I’m not usually that spontaneous, but I am so glad I said “yes”! It was a casual open mic and a very friendly gathering. 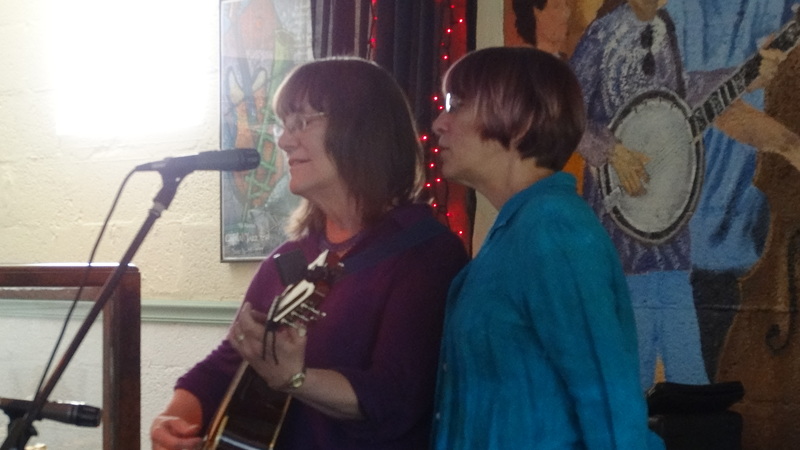 We had a great time singing and yodeling, and we got to see some amazing picking from the host and his bandmates. There was also a poet who shared her work and it was quite good, moving and honest and delivered with style. The food was outstanding and we will definitely go back, even if it’s not open mic night. It was a wonderful last evening of a fabulous vacation and I am still feeling relaxed and inspired from my trip to the mountains. I hope that means I will be finishing some of the creative projects I have started since my return, so my bucket list won’t be the only list getting attention. My “fifty things” list here is feeling neglected. Soon, fifty things list, soon! This entry was posted in Uncategorized and tagged bucket list, labyrinth, North Carolina, open mic, rhododendron festival on July 1, 2013 by releaf1954.